VIA Rail held meetings with its employees cross-country this morning, and then issued a press release. The press release basically states that VIA is cutting its workforce by about 200 people, or 9%. At the same time the release says it is adding trains in some areas. At the bottom of the release, the cuts are spelled out. The Ocean: It will now depart Halifax only three times a week, on Tuesdays, Fridays and Sundays (down from the current 6/week). The Canadian will be reduced during the winter from 3 departures/week to 2/week. Some Southern Ontario trains are cancelled. Surprisingly, the Chaleur (Montreal-Gaspé) is unaffected. With cuts taking place across the federal government, these were not unexpected. It was widely anticipated that the Ocean and Canadian would take hits as both are suffering in ridership during certain periods. I'm not as familiar with the other trains, but it seems as though the Canadian in particular is being set up to fail. Between low service frequencies to begin with, trip times getting longer and longer and uncompetitive pricing (apart from the odd seat sale), it isn't surprising that ridership has dropped off over the years. Marketing is virtually nonexistent too. You rarely see ads for VIA services in the west, to the point that lots of people are unaware that there even is an intercity rail service where they live. Reducing frequencies even further will not help. As a resident of Southern Ontario yet do business in NB, I am aware of the impact on both the Toronto-Niagara Falls run as well as the Ocean in Atlantic Canada. As for the Toronto to Niagara run, they will be losing 60% of the runs which makes sense as the train competes with the GO Trains along the Lakeshore West route. The only part which is not duplicated is from Hamilton to the border. On the Ocean run, with the removal of half of the VIA traffic, it goes directly to a rapidly diminishing bottom line for CN in Atlantic Canada. What I fully expect is that CN will reconsider the operation of the line and look towards discontinuance. The paper traffic is virtually gone from the line. The days are also counting down on the Brunswick Mine traffic. I would expect that the VIA traffic will ultimately move to the mainline thus running at higher speeds and over a shorter distance. OMC, I think VIA wants the Canadian to be a tourist train. In general tourist trains are more popular in the summer. The problem is that the Canadian should also provide basic public transportation, and it has failed to do that for years now. I guess they are throwing in the towel and not even pretending to provide transcon public transportation. Unknown, I totally agree with your analysis. 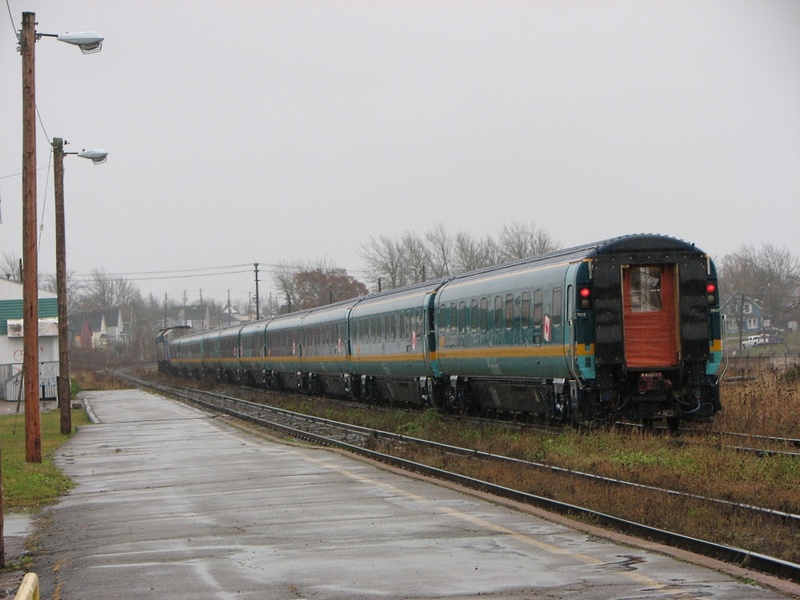 Within a couple of years it will be running on the Edmundston-Moncton line. No wonder nobody was interested in investing money in the northern line. Steve I`m confused. The Chaleur runs Monday-Thursday-Saturday. Does this mean they will be running as separate trains from Matapedia to Montreal? "The Montréal-Gaspé service will remain at 3 round trips per week; the schedule will be adjusted to coincide with the new Ocean schedule." Changing the Chaleur schedule makes sense for VIA, this way they save having an extra crew from Montreal to Matapedia. One wonders what will happen if the Ocean ever moves to the NTR. I work for Via Rail out of the East and will be laid off this coming fall. When I started there was quite a bit of business, more cars, and busy trains. Over time, and after the the change to Ex-CN President Laliberte, train ridership has gone down. It is not because fewer people are taking the train, because we are sold out every trip. It's because the President has chosen to send our trains out with fewer cars and refusing to add extra cars to supply the demand. People have been waiting for over a week to get a train ticket. It's not hard to make it look like ridership is down, if you don't allow people to travel and constantly put up the prices. Explain to me how any of this is good business. I absolutely love the train and all the sights and sounds associated with it. I have many fond childhood memories of train travel. Unfortunately, for travel over long distances in Canada, the train will never be able to compete with air travel with respect to cost and convenience. Even on many shorter routes, the bus is more convenenient as it offers more departure tinmes than the train. There is no point in providing a service at taxpayers expense for which there is little or no demand. "When I started there was quite a bit of business, more cars, and busy trains. Over time, and after the the change to Ex-CN President Laliberte, train ridership has gone down. It is not because fewer people are taking the train, because we are sold out every trip. It's because the President has chosen to send our trains out with fewer cars and refusing to add extra cars to supply the demand." Laliberte is clearly trying to kill VIA. Who put him into office? Ah, yes, I see: Stephen Harper. He's clearly a Harper man through and through. Harper appointed him and told him to kill VIA, and he's doing his best to do so. Harper's a criminal, anyway, as you all know from the Parliamentary investigation. It's embarassing that Canada didn't manage to get him out of office and into prison where he belongs, and it reflects badly on the Governor General and the Queen.